Assabet Valley Mastersingers, in performance since May of 1978, enjoys presenting new and less familiar music in addition to the celebrated masters. Well over fifty different composers have been represented on concert programs, including three commission projects and several New England premieres. This commitment to performance excellence and innovative programming is securely guided by Artistic Director and Founder, Dr. Robert P. Eaton. 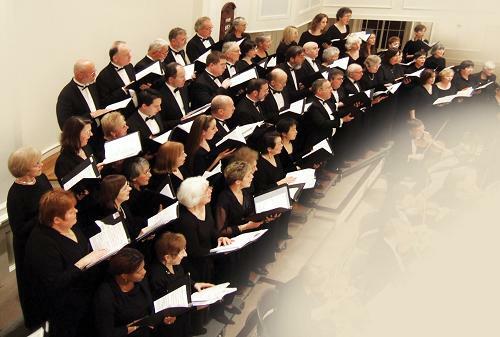 Three major concerts each year are scheduled for November, March, and May, in addition to the annual “Messiah” Sing in December with audience participation. In each case professional vocal soloists and instrumentalists are engaged, whether required accompaniment demands organ, pianos, or orchestra of any size. Monday rehearsals are held each season beginning one week before Labor Day until mid-May–from 7:30 to 9:45 PM. The audition process is principally for voice placement, scheduled after potential members have experienced 1 to 3 open rehearsals. Membership in AVM is diverse in level of training, age (from 20 to over 70), and also geographically (generally representing about 20 towns). Members purchase their own music, pay an annual dues fee, and participate in a fall fund drive to obtain advertisers and sponsors to support the operating budget. The rehearsal site is Church of the Nativity, 45 Howard Street, Northborough, MA. An Apprentice Singers Program is open to high school choral students throughout the region. Selection is made by recommendation of High School Choral Directors and successful audition with AVM’s Artistic Director Robert Eaton. These students participate as full members of the chorus at no cost to them and are provided exciting educational performance opportunities. To apply contact info@avmsingers.org. A small ensemble selected from the Mastersingers, Assabet Valley Chambersingers performs varied programs of unaccompanied madrigals and motets, Broadway show tunes, vocal Jazz standards, and seasonal music. In addition to numerous civic organizations, Tower Hill Botanic Gardens, First Night Worcester, and Nashoba Valley Winery have frequently been sites of these Chambersingers concerts. In many cases funding may be obtained through Local Arts Councils.